Image Credit: MONUSCO Photos via Flickr. 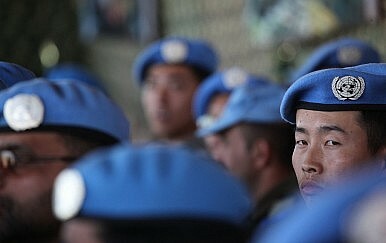 China’s involvement in peacekeeping has evolved to reflect the growing influence of its international trade. In its first two decades as a permanent member of the United Nations Security Council, the People’s Republic of China (PRC) completely abstained from all United Nations Peacekeeping Operations (UNPKOs). A drastic shift in this non-interventionist policy started in the late 1990s and continues to the present, as China now provides more UN peacekeeping personnel than any other permanent member of the Security Council. As its participation has expanded, existing explanations for the shift have refocused from China’s rising global awareness and responsibility, to its world perception and political influence. However, the catalyst for China’s sudden change in strategy is quite simple – it can be attributed to growing global economic benefits, as China continues its rapid climb as a world power. Though the PRC has become an active contributor to peacekeeping missions, its efforts have not been dispersed evenly among all UNPKOs. Instead, China has focused resources and allocated personnel to specific UNPKOs while providing minimal to no support for other missions. Beijing has contributed at a higher level to UN Peacekeeping Operations in states where it has economic interests. In analyzing China’s selective criteria in PKOs, it is clear that China’s massive economic growth has coincided with its participation in UNPKOs. To gain an accurate account of China’s UNPKO participation, Chinese personnel as a percentage of total UN peacekeepers for any specific PKO can be determined. That number can then be compared to the current trade relationship between China and the PKO’s host state, as well as the ratio of Chinese exports to the host country’s total imports. The resulting data verifies that the amount of Chinese exports to a particular host state plays a significant role in China’s placement of UNPKO personnel. This data confirms that China participates at a much greater level in UNPKOs where it has an economic relationship with PKO host state. This suggests a couple of things. First, China not only selectively chooses its PKOs, but in doing so takes advantage of a multilateral institution to favorably advance its own interests. While this is not an uncommon practice among world powers, it highlights the evolving foreign policy, expanding assertiveness, and growing influence Beijing has developed among the world’s most powerful states. Second, by selectively placing its peacekeeping personnel, China gains a strategic advantage in its trade relations by ensuring the continuance of trade to PKO host nations. Through the stability and security that the UN and its PKOs offer, China can ensure continued economic trade. The selective bias detected by this study gives policymakers insight into Beijing’s 21st century global strategy. As its economy and military grow at unprecedented rates, the availability of this information is invaluable in assessing China’s tactics, and predicting its international motives. This will provide policymakers with detail on how to adapt their strategies and counter Chinese primacy. This is an important observation, as the study of Chinese politics and international strategy has made a tremendous shift, and scholars and policymakers alike try to keep pace with the rapid change. China’s peacekeeping participation continues to grow, and this research suggests the trend will continue. As China gains a greater intentional role, greater recognition of its superpower status, and furthers its interaction in the world – economically, militarily, and politically – other powers will respond by adapting policy to advance their own interests. It is clear China chooses to engage in UNPKOs where it enjoys an economic advantage. This shows that China is no longer just a growing power, but is now a legitimate superpower in international affairs. Beijing’s participation in PKOs to further its own interests, within the structure of a multilateral institution, is a strategy akin to an influential state well versed in the international domain – a position which China now holds. Andrew Ludwig is a graduate student at the School of Diplomacy and International Relations at Seton Hall University. His previous work appears in the International Policy Digest, as well as the International Affairs Review of George Washington University.